What’s that saying, “A picture’s worth a thousand words”? If that’s the case, then an in-person view must be worth a million, surely. So you’re in the beginning stages of drawing up your timber frame home plans. You’ve decided on the number of bedrooms and bathrooms, you already have paint colors picked out in your head, and you know there has to be room for an outdoor entertaining space. But, how do you go about choosing the piece of land your dream timber frame home will be built on? What do you need to consider for when the timber frame construction begins? Choosing the right location and build site is the first step in achieving your timber frame home dreams. When searching for the perfect piece of land, though, what do you need to consider? While a great view is important—especially if you plan to add an outdoor oasis or build next to a lake—there are some more practical and necessary items to consider. First, make sure you own the land and that it’s even suitable and/or zoned for construction. It will also be important to find out if any building restrictions exist. Next, address your basic living needs. Make sure you’ll have access to drinkable and running water and can be connected to public utilities. Lastly, if your land is particularly secluded, consider how far you are from a hospital, emergency services, grocery stores, and other conveniences or amenities you are used to accessing daily. Outside of basic living necessities, there are other things to consider before starting to build your timber frame home plans on your chosen land. Determine the focal point of your property, and where the sunlight hits. Make sure the windows are facing the direction of the surrounding land’s best features. The best timber frame home plans look like they fit naturally into the setting while allowing for spectacular views. If the elevation allows for it, be sure to build so that these vistas will be unobstructed. If your chosen piece of land is near a body of water, determine if there will be any potential for flooding or drainage problems that will need to be addressed before building. Also, consider the accessibility for timber frame construction vehicles. If the roads leading to the land for your timber frame house are narrow and winding, that will affect the cost and logistics of getting trucks there. While secluded lots are nice because of the privacy they offer, they may require some extra steps in the planning and development phases. If you’re just starting to look for the perfect site, your timber frame build partner will be great a resource for knowing what to look for and keep in mind. You’ve been dreaming about timber frame homes for a long time, and that picturesque view you’re imagining can be achieved. 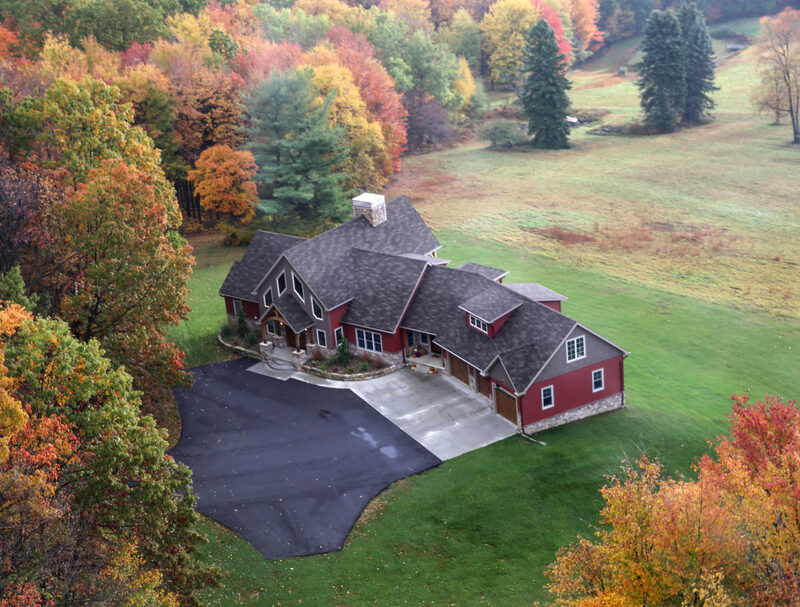 Let Mid-Atlantic Timberframes help you develop your timber frame home plans in the perfect location. Still not sure you know what you want? Review our MossCreek timber frame home plan designs and see if any of these peak your interest. Next - Is a Timber Frame Home in Your Budget?